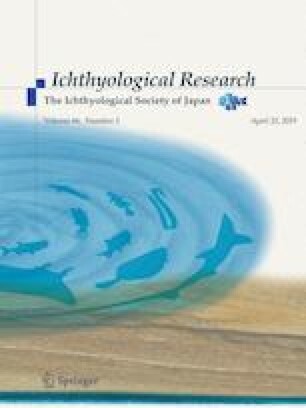 A new species of perchlet, Plectranthias maekawa, is described on the basis of three specimens (58.2–65.1 mm standard length: SL) from the Tokara Islands, Kagoshima, Japan. The new species can be distinguished from all congeners by the following combination of characters: X, 15 or 16 dorsal-fin rays; 14 pectoral-fin rays; lateral line complete with 30 pored scales; 3 scale rows above lateral line; 6 diagonal rows of large scales on cheek between eye and corner of preopercle; two antrorse spines on ventral margin of preopercle; margins of subopercle and interopercle smooth; body depth 33.5–34.7% of SL; body width 17.2–17.4% of SL; third dorsal-fin spine longest, its length 46.2–47.2% of HL; caudal-peduncle depth 58.0–63.2% of caudal-peduncle length; body pinkish-white with five orange-red bands on lateral surface when fresh, first band broadest, first, fourth and fifth bands vertical to body longitudinal axis, second and third bands slightly backwardly oblique; small poorly defined yellow blotches scattered below lateral line when fresh, especially along red bands; scales above lateral line white, with distinct red margins when fresh; most cheek scales white or yellowish-white, without distinct red or yellow margins; body uniformly pale, with reduced nape pigmentation in preserved specimens. Japanese records of Plectranthias wheeleri Randall 1980, closely related to P. maekawa, is reviewed, with additional specimens of P. wheeleri from the Ryukyu Islands and Sagami Bay, Pacific coast of central Japan, the latter representing the northernmost record for the species. An unidentified specimen of Plectranthias from Okinawa, Japan, is briefly described. This article was registered in the Official Register of Zoological Nomenclature (ZooBank) as A4941759-F658-43C8-BDA2-03C17C6C9FC. We are especially grateful to the crew of the FV Daikoku-maru, M. Takayama (KAUM), and T. Maekawa and F. Maekawa (Maekawa Fisheries Co., Ltd., Amami) for their assistance in collecting specimens from the Ryukyu Islands, H. Hata, S. Tashiro, K. Fujiwara and T. Uejo (KAUM) and A. Gill (University of Sydney, Sydney) for their valuable comments on the manuscript, A. Suzumoto (BPBM), D. Catania (California Academy of Sciences, San Francisco), J. Williams, S. Raredon, K. Murphy and D. Pitassy (the U.S. National Museum of Natural History, Washington, D. C.), and A. Kaneko and K. Miyamoto (OCF) for opportunities to examine specimens of Plectranthias, G. Hardy (Ngunguru, New Zealand) for reading the manuscript and providing help with English, and Y. Haraguchi and other volunteers and members of the Laboratory of Fish Systematics (KAUM) for curatorial assistance. This study was supported in part by JSPS KAKENHI Grant Numbers JP26241027, JP24370041, JP23580259, and JP26450265; the JSPS Core-to-Core Program: B Asia-Africa Science Platforms; the “Biological Properties of Biodiversity Hotspots in Japan” project of the National Museum of Nature and Science, Tsukuba, Japan; “Establishment of Research and Education Network on Biodiversity and Its Conservation in the Satsunan Islands” project of Kagoshima University adopted by the Ministry of Education, Culture, Sports, Science and Technology, Japan; and the “Island Research” project of Kagoshima University.